The Red Pepper House is located on Lamu Island in Kenya. Lamu was declared a World Heritage Site, and the thousand year old Swahili culture has been preserved there. The Red Pepper house consists of five nyumbas (houses) offering guests an idyllic isolated location. 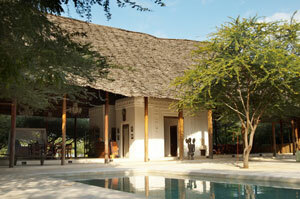 Located a short distance from Lamu town, the eco lodge sits between a beautiful beach and lush forest. Each nyumba has a sea view and a private butler to assist with any needs and lead on any excursions if necessary. Houses consists of a bedroom and bathroom, a living area, a veranda, a private enclosure with beach sand and an open air African shower, and an outside private space on the beach. The Red Pepper House blends in with the surroundings with a makuti thatched roof and was constructed with techniques inherited from their Swahili ancestors. The majority of the hotel is very open, allowing guest to enjoy the tropical breeze and climate. The Acacia nyumba is a larger, spacious suite which also includes a study room. Meals range from authentic Swahili cuisine to meals from the Mediterranean. The light, healthy cuisine consists of fresh, organic ingredients. Breakfast, lunch, and dinner will be served whenever you choose and appetizers are offered all day next to the pool. Activities at The Red Pepper House include bird watching, dhow trips (Arabian influenced boats), fishing, snorkeling, and visiting Lamu town. The staff at The Red Pepper House are very accommodating and will even prepare a private dinner for you on the beach with a menu of your choice. The temperate at Lamu Island ranges from 26-34 degrees, with the coolest months from April to September and the hottest months from February to March. Frequent rain occurs in May and June. The ideal time to go snorkeling is from October to April. November to April is great for dolphin watching. The best time for fly fishing is from November to March, while the best time for deep-sea fishing is from August to May. Like all of our lodges, The Red Pepper House gives back to the local community in a number of ways. They partner with the NGO Anidan, which cares for over 250 children by providing dining rooms, schools and a hospital, and provides help for the nearby village of Wyoni and a Borana tribe. Gunn’s Camp is one of the last remaining vintage, luxury safari camps. Overlooking Chiefs Island and situated next to the Moremi Game Reserve, Gunn’s Camp offers a tranquil setting where clients can truly experience the sights and sounds of the wilderness. Gunn’s Camp consists of 6 deluxe meru tents overlooking the Okavango Delta. Ideal for those looking for a personalized safari experience, Gunn’s Camp ensures privacy and a relaxing atmosphere. Each tent has been decorated with a unique mix of African furniture. An elevated wooden walkway connects the lodges to the main camp where guests can enjoy the dining room, lounge, bar, and swimming pool. 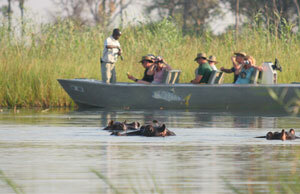 Gunn’s Camp offers a variety of activities and eco tours such as mokoro excursions, sunset cruises, and bush walks. Enjoy floating down the river on a traditional mokoro canoe, which are propelled by guides so the guests can relax and enjoy their surroundings. Guests can also enjoy the river on a motor boat sunset cruise. Bush walks are led by private, local guides who have an abundance of knowledge on the surrounding areas. The Okavango River never meets the sea, and its crystal clear waters stretch across the Kalahari Desert, creating a haven for Africa’s incredible wildlife. Gunn’s Camp strives to preserve the Okavango Delta and its surroundings by utilizing a solar-panel that provides power for the entire camp. Idube is a safari lodge situated in the Sabi Sand Game Reserve, part of the greater Kruger National Park in South Africa. The main lodge was designed to blend into the bush, with a thatched bar and lounge area. The lounge is a great place to relax and watch the wildlife that wonders into the area. The swimming pool is also a great location for bird watching and game viewing. The lodge consists of 10 chalets, accommodating a maximum of 20 guests. The Makubela Suites, completed in February 2011, are Idube’s newest suites. They have a bedroom, lounge, large bathroom with bath and shower, a separate outside shower, and an outside deck. There are 2 game drives daily in open landrovers. 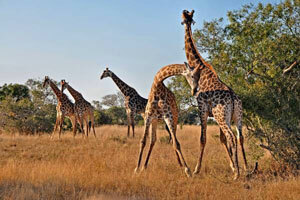 The area is home to the big 5, in addition to many other animals, including giraffe, cheetah, and many different bird species. After game drives, guest can enjoy the pool, bird watch, or relax on their private deck. If you want to experience luxury Safari South Africa more, hot air ballooning, panoramic trip, helicopter tours, and a cultural village experience can be arranged. Breakfast and lunch are served on the open air dining deck and dinner is enjoyed in the lantern lit boma. Meals consist of simple, healthy, fresh food that is all included in the booking package. Global Basecamps offers a wide array of African safari tours, from traditional Tanzania safaris to unique wildlife viewing experiences on the Okavanga Delta. To learn more about our Africa ecotourism options please give us a call at (866) 577-2462! Which of the above 3 lodges would you most like to stay in?